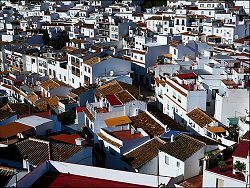 The attractive and popular white-washed village of Mijas sits at around 400m above sea level and 5Km inland from the Costa del Sol coastline, giving it commanding sea views. 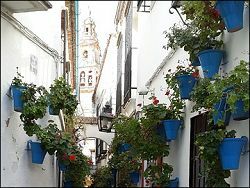 The village clings to the side of the hill and its character of its narrow cobble streets have help inspire many artists and writers. 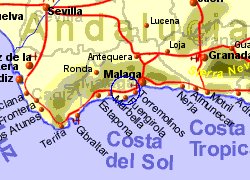 The large municipality, which has a population of around 80,000 (with around a tenth of those living in the village), extends to the coast between Fuengirola and Marbella, where the 12Km of coastline is known as Mijas Costa, and includes La Cala and Calahonda, together with the residential and commercial area of La Lagunas. This area is well supplied with golf courses. 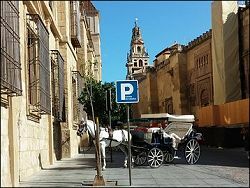 Both the village itself and the costa have plenty of bars, restaurants and accomodation. 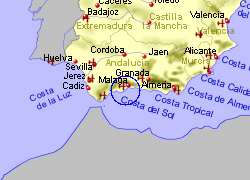 Map of the Mijas area.